QINGDAO, June 10 (Xinhua) -- Chinese President Xi Jinping and his Mongolian counterpart Khaltmaa Battulga on Sunday pledged to enhance bilateral cooperation during their meeting at the Shanghai Cooperation Organization (SCO) summit. Describing China and Mongolia as close neighbors linked by mountains and rivers, Xi said that developing bilateral relations is in the fundamental interests of the two peoples. 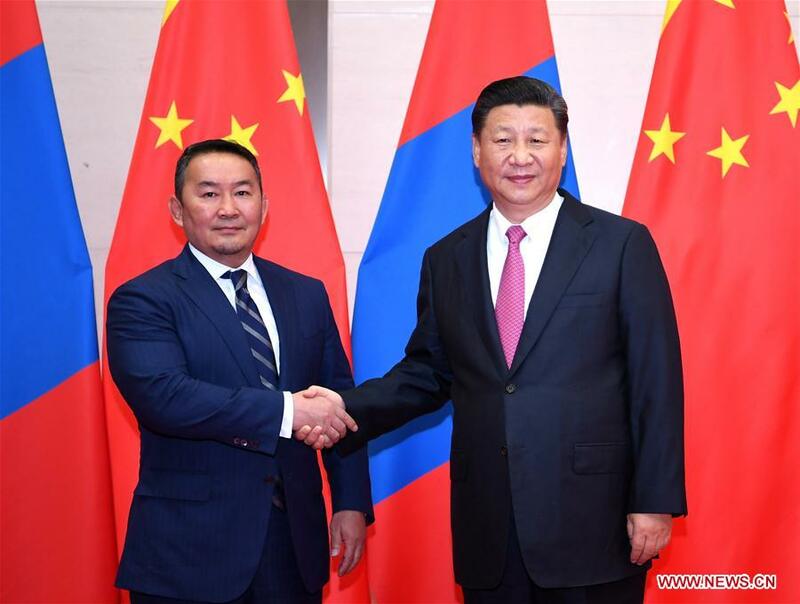 Xi commended his Mongolian counterpart for attaching importance to bilateral relations and for his readiness to advance the comprehensive strategic partnership with China. "Based on the principles of mutual trust, cooperation and mutual benefits, China is willing to work with Mongolia to seize opportunities, remove interferences, and solidly carry out exchanges and cooperation in various fields so as to enrich the partnership and open up new prospects for bilateral cooperation," Xi said. The Chinese president said that both countries should adhere to the right direction of bilateral friendly cooperative relations from a strategic height and long-term perspective, and understand and respect each other on issues involving their respective core interests and major concerns. Both sides should maintain the momentum of high-level exchanges, strengthen exchanges in various fields and on various levels, and enhance political mutual trust, Xi said. He called for carrying out mutually-beneficial cooperation using their respective advantages, giving play to the leading and guiding role of major projects in bilateral pragmatic cooperation, and facilitating the alignment of China's Belt and Road Initiative and Mongolia's "Development Road" program. People-to-people and cultural exchanges should be increased, Xi said, calling on the two countries to well organize activities to commemorate the 70th anniversary of the establishment of diplomatic relations between the two countries next year. While pointing out that Mongolia is the first observer state of the SCO, Xi said that China supports Mongolia in raising its cooperation level with the organization. China stands ready to work with Mongolia and Russia to implement the outline for building the China-Mongolia-Russia economic corridor, and push for greater progress in trilateral cooperation. Battulga congratulated China on successfully hosting the SCO Qingdao summit. He said that Mongolia is ready to raise its cooperation level with the SCO. He expressed appreciation to President Xi for his personal care for advancing relations of the two countries. He also spoke highly of China's important contribution to safeguarding peace and stability in the northeast Asian region. Developing friendly relations and mutually-beneficial cooperation with China is a diplomatic priority of Mongolia, he said. He said that Mongolia adheres to the one-China policy, and holds that both Taiwan and Tibet affairs are China's internal affairs. It will properly handle the issues based on these principles, he said. Mongolia hopes to keep high-level exchanges with China, increase exchanges and cooperation in various fields, and deepen friendship between the two peoples, he said.